"No one understands what my life has become." IFC Films has debuted the first official trailer for Certain Women, the latest film from American filmmaker Kelly Reichardt which first premiered at the Sundance Film Festival earlier this year. The film is about the lives of three women which intersect in small-town America, "where each is imperfectly blazing a trail." The indie drama stars Lily Gladstone, Laura Dern, Kristen Stewart, Michelle Williams, James Le Gros, Jared Harris and Rene Auberjonois. This definitely has a very raw and realistic feel to it, and that's thanks to Reichardt. I'm personally not a fan of her work, but other critics lover her and have been raving about this film as well. Stewart is barely in this trailer, it seems to be about newcomer Lily Gladstone who looks impressive. If you're curious, take a look. Certain Women drops us into a handful of intersecting lives across Montana. A lawyer (Laura Dern) tries to diffuse a hostage situation and calm her disgruntled client (Jared Harris), who feels slighted by a workers' compensation settlement. A married couple (Michelle Williams and James Le Gros) breaks ground on a new home but exposes marital fissures when they try to persuade an elderly man to sell his stockpile of sandstone. A ranch hand (Lily Gladstone) forms an attachment to a young lawyer (Kristen Stewart), who inadvertently finds herself teaching a twice-weekly adult education class, four hours from her home. 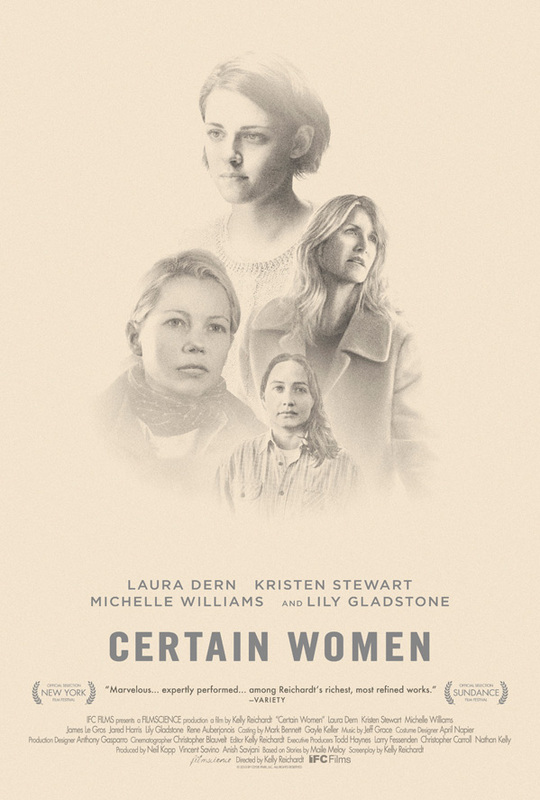 Certain Women is both written and directed by filmmaker Kelly Reichardt, of the films Old Joy, Wendy and Lucy, Meek's Cutoff and Night Moves previously. This first premiered at the Sundance Film Festival. IFC Films will release Certain Women in limited theaters starting October 14th in the fall. ;D I acknowledge that she is trying to be part of "intelligent" movies. She was pretty decent in Camp X-Ray. But man! Her face bugs me. She looks like a teen goth. She needs to take smiling courses. I respect her for sticking to the brooding look. I strongly think most women in Hollywood are pinned into boxes where they have to act a certain way for the people. I respect Stewart's commitment to always looking dower and sad. I don't really think she is a peach or anything, but she is doing her own thing and that is cool too. I respect your respect for her. And I didn't mean to be mean. It's just sad faces are quite depressing to me. Agreed wholeheartedly. Fearmongering, starvation and mass (media)entertainment are the three strings pulled by the masters of this world to manipulate the masses. When someone wants to kill his dog. He accuses it of rabies. Or so says a French idiom. Forgive my approximate translation. ;D Daech, the Al Qaeda version 2 will stick around for a while alas, until those who created them will finish their destrucrive destructuration of the Middle-East and beyond... Don't you find this sad joke insulting to our intelligence? How come a bunch of fanatics who can't craft a single bullet can defeat the whole world (read the USA), when Hitler and his impressive and powerful military industries and Reich failed miserably? I forgot how good Michele Williams is as an actor. She needs a higher output of great films! There must be something to her passion that directors find appealing. She has worked with some heavy talent, that I feel, would not have put up with a lot of diva-like behavior.